Rabbits express themselves so differently from predators like cats, dogs and humans that it can be difficult to figure out just what they're doing and why. Nearly every action has some sort of meaning to a rabbit, whether it's fear, joy, establishing dominance or pure curiosity. Chin rubbing isn't just about scratching an itch -- it's a signal to other rabbits. Your rabbit has a small scent gland on his chin. When he rubs his chin against something, a small amount of his specific scent is deposited on the object. Fortunately, humans can't smell this scent and there is no visible residue. Chin rubbing doesn't damage fabric, furniture, walls, clothing or anything else your rabbit decides to scent. Other rabbits can easily smell the scent left behind by chin rubbing. They use the odor to identify territory. A rabbit may mark everything he thinks he owns, like his food bowl, his sleeping area, the edges of his cage and his human companion with his chin. 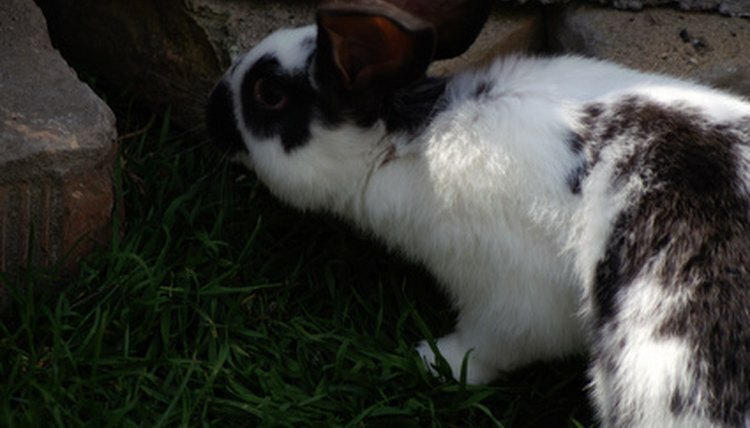 Some rabbits immediately start marking territory when they enter a new place, while others will take their time to decide when and where to mark. While chin rubbing is essentially harmless to furniture, carpet and other objects in your home, other methods your rabbit might use to mark his territory are not so pleasant. Both males and females can spray urine to designate their space. Your rabbit will also leave behind a few large droppings to make sure all the other rabbits know the place is his. Some rabbits will use chin rubbing almost exclusively to mark territory, while others prefer urine spraying and droppings. Chin rubbing is harmless, as well as cute to watch, when you only have one rabbit who is not threatened by humans or other pets in his space. Rabbits are very territorial, however, and when other rabbits, animals and sometimes even humans enter a marked space, your rabbit could become aggressive. Pay special attention to areas he marks frequently and with vigor. Give each rabbit enough space to call his own, and try to keep other pets and children out of places your rabbit thinks of as his own personal space, like his cage or bed. Vetstream: Why Does My Rabbit...? Belgian Hares: What Is Your Rabbit Saying?